Blues harp master Smoky Greenwell’s new release South Louisiana Blues provides a history lesson in blues music. His latest independently released album grabs the listener firmly by the ears and doesn’t let go! With Greenwell’s multi-instrumental talent on full display, fans will not be disappointed by the quality that can be heard on each track. The Wilbert Harrison tune “Let’s Work Together” is the message for not only people in general, but especially politicians to get along. It screams for people to put aside their differences and realize that we only go around once, so we might as well do the best we can to get along with each other. For those who are in the mood to get down and boogie, “Boogie Twist” is the just what the doctor orders to help get one’s groove on. “Boogie Twist” is a classic blues jam with that is sure to let your hair down type of a song perfect for any celebratory occasion. “Lonesome Lonely Blues” begins with a smooth riff on the tenor saxophone by Greenwell, who lends his talent to all the horns featured on the album in addition to his mind-blowing harp skills! “Lonesome Lonely Blues” is a classic blues love ballad that all can relate to. It tugs at the heart strings and brings closure to a love that didn’t work out the way it should have. A Chicago blues number if there ever was one. “I’m Glad She’s Mine” is the exact opposite of “Lonesome Lonely Blues.” Here’s a song for any love bird who wants to crank up the music and sing from the top of their lungs letting the world know they have found the one true love that makes them whole. 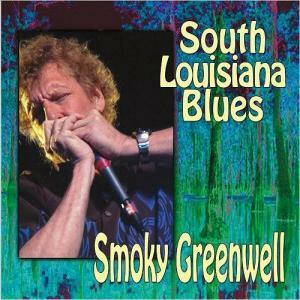 South Louisiana Blues is sure to be a favorite of Smoky Greenwell fans, new and long time. It has everything a blues fan can want from harp playing by Greenwell himself that will leave the listener spellbound. The album mixes a hint of funk with jump blues and swing that will make it difficult to sit still when listening to this album. Greenwell is a force to be reckoned with and he really brings it with his harp and horn playing, and his powerful vocals. He brings the music of New Orleans and Louisiana to life. South Louisiana Blues is a must have for any lover of blues harp and blues music.